[150 pages Report] The video streaming software market size to grow from USD 3.25 billion in 2017 to USD 7.50 billion by 2022, at a Compound Annual Growth Rate (CAGR) of 18.2%. The increasing need for transcoding to deliver videos to a large number of end-users and the growing demand for on-demand services are some of the factors driving the growth of the market. Extensive opportunities in Small and Medium-Sized Enterprises (SMEs) and high growth in the education sector are expected to offer huge market opportunities in this market, in the next 5 years. The base year for the study is 2016 and the forecast period is considered to be 2017 to 2022. Wireless network traffic is majorly dominated by videos, and in the past few years, the consumption of online media has shown a tremendous increase. With the increasing use of mobile devices and high-speed connections, online video contents are at the fingertip of consumers. The online video trend is exploding the amount of internet traffic at a high rate. It is expected to account for nearly 60% of the total internet traffic. The increasing use of mobile devices is expected to fuel the online video traffic. Online videos have a strong impact on the decision-making power of a consumer. According to a survey conducted by one of the leading online video solutions providers, Brightcove Inc., nearly 75% of the end-users feel there is a link between watching videos and their decisions for purchasing products. Online videos are expected to be the future of content marketing. It is an easy way to reach out to potential customers. According to Ericsson report, the time spent on mobile devices for watching TV and videos has grown by 85%. According to the International Telecommunication Union (ITU), the Internet penetration has grown 7 times higher, from 6.5 to 43% in between 2000 and 2015. There has been an upsurge in digitization and video CDN among diverse businesses. This advancement is expected to increase the usage of mobile devices for the video streaming solution on a real-time basis. Mobile video streaming apps, such as Facebook and YouTube, help users view, share, and store videos and advertisements from anywhere. These apps are expected to be increasing the demand for video streaming solutions among smartphone users. In the future, these apps are expected to continue to lead the video market. Moreover, the growing use of mobile devices for video streaming is expected to create opportunities for drones and the GoPro broadcasting. The major and key video streaming software vendors include Brightcove, Inc. (US), Haivision, Inc. (Canada), IBM Corporation (US), Kaltura, Inc. (US), Kollective Technology, Inc. (US), Ooyala, Inc. (US), Panopto (US), Polycom, Inc. (US), Qumu Corporation (US), Sonic Foundry, Inc. (US), VBrick (US), and Wowza Media Systems, LLC (US). In March 2017, Brightcove partnered with Southern Cross Austereo, an Australian commercial broadcasting company, to deploy its Video Cloud platform. This will allow Brightcove to publish videos faster through a single IVP and manage its entire content workflow. In January 2017, Kaltura partnered with the University of the West of England (UWE) to deploy its video platform for over 500 courses. This will enable students to produce their videos on any mobile device, easily embed it into an assessment, and then securely submit the assessment to the lecturer via the Virtual Learning Environments (VLEs). In January 2016, IBM acquired Ustream to propel its cloud-based video services across industries and extend its cloud platform to help enterprise clients unlock the value of videos. What are new enforcement points which the video streaming companies are exploring? Extensive growth of online videos and the growing demand for on-demand streaming are expected to drive the video streaming software market to USD 7.50 billion by 2022. Videos have become a powerful and effective tool for communication. The video streaming technology facilitates the transmission of video files, with the help of streaming transcoders, streaming servers, and other related software, to provide uninterrupted videos to the viewers. The video streaming software empowers enterprises to create, store, manage, monitor, and share the video content across its systems, be it internally for communication purpose or to present the information externally to a live audience. Video streaming is a type of delivery mode, wherein the video content is delivered through Content Delivery Networks (CDNs) from a provider to multiple end-users. Videos are sent in a continuous stream of data; hence, it allows users to view online videos without downloading them. Video streaming software comprises software such as transcoding and processing, video management, video delivery and distribution, video analytics, and video security. Increasing traction of Video-as-a-Service (VaaS) in enterprises due to lower cost of ownership, the extensive growth of online videos, and growing needs for on-demand streaming are driving the video streaming software market. 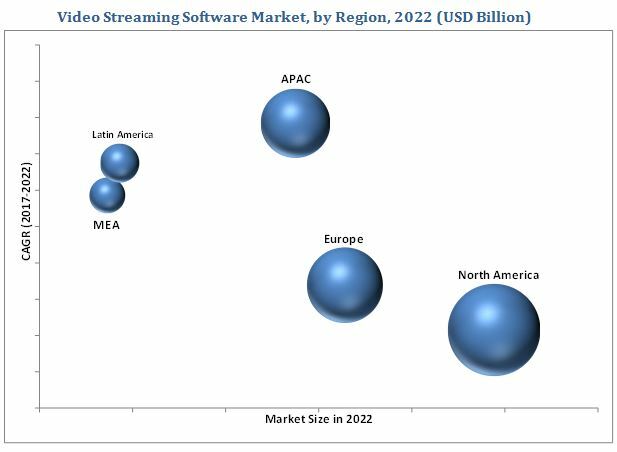 The video streaming software market comprises software such as transcoding and processing, video management, video delivery and distribution, video analytics, and video security. The software is used to deliver videos over the internet, for corporate internet communication as well as for the live audience. Videos are a crucial element for corporate communications. Video is considered as one of the most powerful tools of the media industry. It is not just used for corporate training, executive communication, event streaming, and knowledge sharing, but also to gain deep insights into the audience behaviour. Video analytics helps analyze how exactly the network and content are impacting the communication engagement. It also helps understand how well the delivered video is accepted by the targeted audience. It also enables enterprises to identify the network inefficiency, which can be addressed in time to ensure a flawless viewing experience. All the data gathered is then collected in a dashboard. The data is collected across devices and locations. The dashboard enables enterprises to study the quality and performance of the video. Video analytics analyzes the viewership trends and throws light on who is watching what content, and on which device. In a broader term, video analytics helps gain an end-to-end view of the video performance from servers to the network, and to the players. Along with video analytics, AI is also expected to transform the face of online video services. AI helps identify and understand the content viewed on videos. AI technique seems to be very useful at the transcoding phase, as while transcoding a video, its quality degrades. AI analyzes every single shot in a video, and then, it is compressed in such a way that the quality of the images remains the same, but the video is delivered in good quality. The video streaming software market size is expected to grow from USD 3.25 billion in 2017 to USD 7.50 billion by 2022, at a Compound Annual Growth Rate (CAGR) of 18.2% during the forecast period. 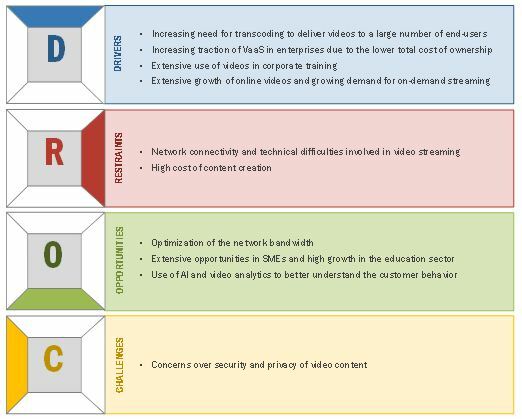 The major growth drivers of the video streaming market include increasing need for transcoding to deliver videos to a large number of end-users, and the growing demand for on-demand services. 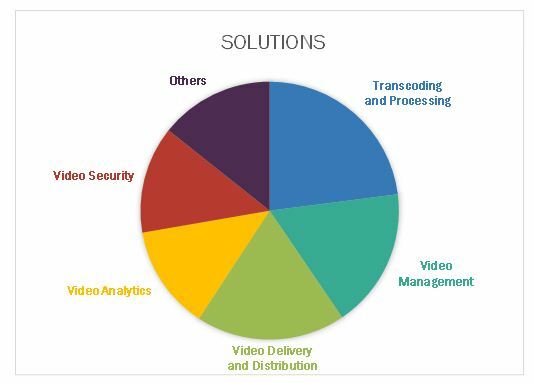 The video streaming software market by solution segmented is further segmented into transcoding and processing, video delivery and distribution, video management, video security, video analytics, and others. The market for video analytics segment is expected to grow at the highest CAGR between 2017 and 2022, owing to factor such as video analytics offer enterprises a 360-degree view of their viewer habits and behaviours, producing revealing intelligence that supports their strategic goals. 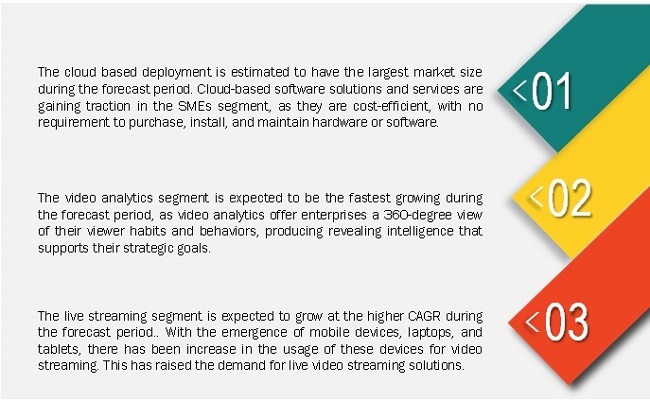 The video streaming software market in APAC is expected to grow at the highest CAGR during the forecast period. APAC offers potential growth opportunities owing to the increasing usage of digital media among the organizations and individuals, and the rising awareness regarding business productivity in this region. Intrinsic strength, rapid economic growth, and increase in considerations of video streaming platform usage make this region the fastest-growing market for video streaming. This market is also expected to have the “next big explosion” with regards to the escalating number of adoptions in the video streaming market. In recent times, the media and entertainment industry is rapidly evolving. In traditional media value chain, the content is created for a particular channel and then broadcasted to millions of viewers. Delivering media content to any connected device has become the most crucial broadcast industry trend. For video streaming, rich media services are offered to individual customers through a variety of devices, no matter where they are situated. The acceleration is being driven by the rapid adoption rate of various types of content available on the internet and the emergence of devices such as tablets and smartphones offering high-quality viewing experiences. This provides a major opportunity for entertainment content companies to grow in the market at a steady rate, during the forecast period. The delivery of video, audio, and other media content over the internet can be termed as video streaming media. Video streaming software empowers operator and media companies with great opportunities to produce social and personal pay TV experiences over various devices. The software also helps in maximizing monetization, minimizing operational overheads, offering better services, and enhancing viewing experiences. Video streaming software empowers broadcasters to launch and deliver a live streaming content under 60 seconds to any device with just a single configuration. The video streaming platforms are highly scalable and ensure a greater Return on Investment (RoI). Video streaming software provides a wide range of platforms in the BFSI vertical. Some of the platforms are algorithmic trading, electronic transaction monitoring, and dynamic pre-trade analytics. Furthermore, the BFSI vertical has also adopted the video streaming platforms to facilitate content analysis and reporting and to ensure regulatory compliance and risk management. Leading BFSI organizations are leveraging audio and video media across the industry and keeping employees up to date about rigorous rules and regulations. Video content helps in collecting key facts and details, and building an effective training and knowledge sharing tool. 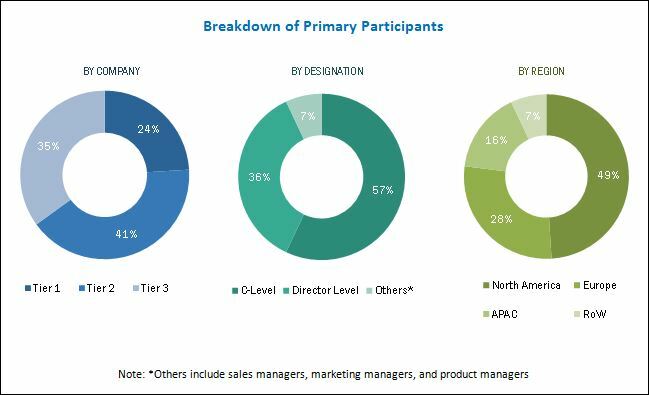 The healthcare vertical is a comprehensive sector, which has to deal with diverse clinical, administrative, and financial content on a daily basis. This brings in the need for channelized content insights and accurate clinical information consolidated through the deployment of video streaming platforms. Enterprise video technologies have enhanced the level of patient care, by providing rich content and communication options. With the usage of enterprise video equipment, patients and their relatives can communicate with each other. Patients and their healthcare team can also have face-to-face conversations with family members, located anywhere in the world. These systems help doctors in discussing the various treatment options. Besides, it also provides the much-needed interaction and emotional support from the family members. Patients also appreciate the opportunity to participate in such support groups via live streaming video or on-demand videos. Moreover, the videoconferencing technology contributes directly in platforms such as patient monitoring, consultation, and counselling. Healthcare organizations and video streaming service providers are implementing these platforms due to the benefits that these platforms offer. What are the applications areas of video streaming? The network connectivity issues and technical difficulties involved in video streaming are the major restraining factors for the video streaming software market. Low internet connection negatively impacts the quality and performance of a live video. Developing countries face severe network connectivity issues, such as inconsistent speeds, poor and fluctuating strength of connectivity, and prolonged periods of downtime. Such conditions hinder the efficient functioning of video streaming solutions, which in turn, affect their adoption. Key and major video streaming software vendors include Brightcove, Inc. (US), Haivision, Inc. (Canada), IBM Corporation (US), Kaltura, Inc. (US), Kollective Technology, Inc. (US), Ooyala, Inc. (US), Panopto (US), Polycom, Inc. (US), Qumu Corporation (US), Sonic Foundry, Inc. (US), VBrick (US), and Wowza Media Systems, LLC (US). The increase in video streaming solution helps organizations advertise their business and solutions to people and investors on social networking websites, such as Facebook and YouTube. Video transcoding refers to the translation of a video from one digital format to another, in which the file format, audio, and video are translated in an instant. In the process of transcoding, an already-compressed (or encoded) content is decompressed (decoded) and then altered and recompressed. Many leading companies in the video streaming software market are providing cloud-based transcoding, which quickly converts any type of uploaded video into various formats so that the viewers within the enterprises can get the best quality of video in the formats compatible with their devices. In addition, the cloud-based transcoding reduces the overheads of owning the hardware. Companies such as Kaltura, Inc. enable Content Aware Encoding (CAE) during the encoding process, which examines each individual video’s characteristics and optimizes encoding accordingly, also reducing the playback bandwidth and storage requirement on the end-user devices. Transcoding and processing solution in a typical video streaming software suite comprises video capture, storage, and encoding functionalities. Video transcoding is a major issue faced by the enterprises for both the on-demand video broadcasting and live streaming and adds complexity to the streaming of videos. Adding the transcoding capabilities to the video streaming suite increases the options for how to produce and deliver the video stream. Video management solutions enable the enterprises to centralize and manage the videos. Some of the necessary features of video management include video search and discovery, metadata, editing, and content management. In the enterprises, videos are recorded from a variety of devices, including laptop cameras, webcams, professional video cameras, mobile devices, tablets, microscopes, and electronic whiteboards. These videos are stored in libraries on the cloud, which makes it easy to save, sort, and search the entire video library. There is an option to label videos with standard descriptive fields or create custom metadata for the unique identifiers. The creation of metadata enables the users to search across the video libraries and within videos for specific content. Video search tools leverage technologies such as Automatic Speech Recognition (ASR), Optical Character Recognition (OCR), and slide metadata to allow users to search across whole video libraries for any word spoken or featured in a video with a single click. The video editing tools help to trim or create multiple clips from a single video, generate thumbnails from videos, or upload external images. The video delivery and distribution is done through Content Delivery Network (CDN). The companies in the video streaming software market provide a variety of delivery options in the form of internet-based delivery with professional CDN vendors, behind-the-firewall delivery with Enterprise CDN (eCDN), or dual delivery. Global CDN vendors include Akamai, Amazon Cloud Front, Limelight Networks, and Level3, which handle the streaming for the enterprises at competitive pricing. Bigger companies such as IBM and Kaltura have their own eCDN that they provide with the bundled package of their video streaming software suite. The eCDN enables the enterprises to relieve bottlenecks associated with delivering security-enhanced video to single or multiple corporate connections and ensures network security by offering a flexible and scalable content delivery solution without the need for costly hardware deployments. Recently, the Software-Defined (SD) CDN has also gained traction among the enterprises, which works by deploying a software layer that transmits, receives, and processes metadata between the sources of video content (streaming servers, CDN edges, transit lines, ad-hoc edges) and the destination of the video content, i.e., end-user viewing devices. The unique capabilities of SD-CDN include the ability to scale automatically, the ability to leverage a combination of edge resources, and built-in monitoring capabilities. Through video analytics, the enterprises can club the AI, machine learning, and cognitive technologies to get actionable insights from the video files. The video analytics tools include indexer to extract spoken keywords from the videos to help in search and recommendation, motion detector, face detector to detect faces that appear in videos and track the movement of faces over multiple frames, face emotion detector to recognize the emotions of a person or crowd over time based on the facial expressions in the video, video optical character recognizer to extract typeset words from video content, and content moderator. Companies such as IBM provide cognitive solutions that are powered by its technologies, such as Watson, which provide the enterprises a 360-degree view into their viewer habits and behaviours, producing revealing intelligence that supports their strategic goals. The video analytics tools also track various social media streams to identify complex patterns that assist the companies to improve content pairings and find new viewers interested in existing content and simultaneously analyze the social media feeds, providing word-by-word analysis of audience sentiment to the live events. Security is an important parameter considered by the enterprises while choosing a video streaming software. Tools such as DRM and encryption provide end-to-end protection, which ensures the enterprises that the streamed content is viewed only by authorized viewers and cannot be recorded and used by non-official/illegal distribution channels. The encryption in case of video streaming comprises encryption at the rest for the stored content and encryption in motion/stream encryption, where the video is transmitted over Real-Time Messaging Protocol encryption (RTMPE) and Hypertext Transfer Protocol (HTTPS) encrypted protocols. The content URLs are secured with an encrypted expiring token embedded in the stream’s URL and ensuring that content cannot be ripped from the CDN. Other security tools include DRM in which various access control technologies are used to restrict the usage of the video content. Some of the major DRM solutions available include Google Widevine, Microsoft PlayReady, and Apple Fairplay. The companies also use forensic watermarking for enhancing the video security in which a unique indivisible mark is added to the content, indicating the originator of the video content and also the authorized user accessing the content. Others segment comprises solutions such as video monetization, video API, and video player. Video monetization tools help the enterprises to increase their revenue and customer retention by analyzing the video viewability, tracking revenue, and creating effective marketing campaigns. Monetization services can be ad-based, pay-per-view, donation based, or subscription based. Video players help the companies to present the recorded and live content to their audience. The video player forms the first point of contact for companies with their audience and thus should be lightweight, fast, interactive, attractive, and should be supported on multiple devices. APIs provide the programmable access to every core service of the streaming platform. They provide the option of customization and adding features to suit the specific needs of the end-users. Good APIs enable the integration of various solutions, services, and widgets to create a unified experience within the chosen environments. Which are the top end users i.e. industry verticals where video streaming software can be implemented for revenue generation? What are the potential opportunities in the adjacent markets, such as enterprise video management?